The front page of the 4th Exchange Series discussion report. Access to information is the challenge at heart faced by developing countries in financing adaptation projects. Critical information and knowledge gaps in the region include: a) most climate change modeling and projections are only available at the global or regional levels, leaving the climate impacts at the local level still uncertain; b) as the new architecture for global adaptation funding is still emerging, the requirements needed for future adaptation projects remain largely unclear; and c) as the incremental climate benefits are often difficult to separate from the effects in traditional development projects, eligibility for adaptation funding has not be well-defined. 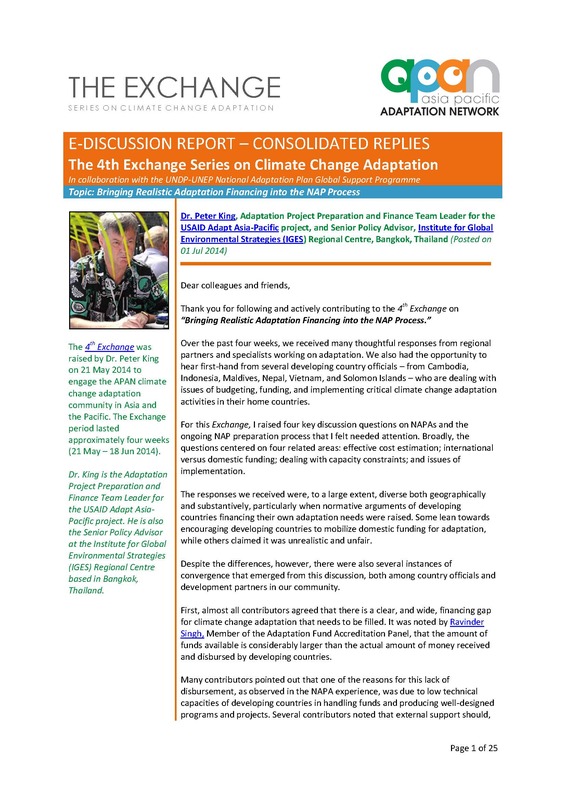 The Asia Pacific Adaptation Network (APAN) Exchange Series on Climate Financing is a facilitated email information exchange platform operated and supported by USAID Adapt Asia-Pacific. The Exchange seeks to capture, consolidate and share tacit, experience-based knowledge from the ADAPT Asia-Pacific country representatives and development partners. Each of the Exchange Series asked participants to consider the specific questions. They allowed participants to share key lessons and challenges, and to highlight and provide insights from current activities in the Asia-Pacific region. Details of each of the Exchanges and detailed participant responses and other contributions are available below. Climate change is a survival issue for many of the low-lying atoll Pacific Island countries and potentially damaging for the bulk of the population living in the coastal zones. The discussion focuses on the issues surrounding climate finance access for these vulnerable Pacific Islands. In this 2nd Exchange that ran through the entire COP19 season, we heard a diverse range of views from developing country representatives, researchers, and development partners on their expectations for the GCF. Is ‘resilience’ an operational alternative to ‘adaptation'? There appears to be little consensus in the conceptual understanding between ‘resilience’ and ‘adaptation’. If climate finance is to be “new and additional” then there is a justifiable concern that funding “resilience” may be used by donor countries to blur the distinction between Official Development Assistance and climate finance. The discussion questions focus on NAPAs and the ongoing NAP preparation process in four related areas: effective cost estimation; international versus domestic funding; dealing with capacity constraints; and issues of implementation. In preparation for the 2014 USAID Adapt Asia-Pacific Annual Forum, the discussion centers on the theme of the forum: Strenghening Country Systems to Access and Manage Climate Finance in Asia and the Pacific. The discussion followed COP20 in Lima, Peru to seek opinion about the negotiations as they relate to climate finance (particularly, the capitalization/pledging of funds to the GCF) and how that might impact the post-2015 climate agenda. In this discussion, many practical examples, as well as theoretical insights, on how to mainstream gender into climate change adaptation activities were shared from across Asia and the Pacific. From the discussion, two clear issues emerged: the question of how to ensure more efficient flow of money from the global level reaching the local level; and the challenge of matching national level and local level priorities. Participants agreed that identifying priorities is the easy part, but taking pilot projects to scale after the priorities have been identified proves to be tougher and will require cross-institutional cooperation and coordination that can be challenging for many developing countries. This discussion explored how best to develop country capacities to manage the project preparation process in order to ensure ownership and sustainability of adaptation activities. Women are often excluded from decision making in relation to climate change adaptation. Participants shared their individual experience with women's role in adaptation and activities supporting women’s empowerment on-the-ground. Development programs come and go. How to ensure that donor-driven programs continue to deliver results beyond the life of the project? Suggestions include engaging communities, stakeholders and project beneficiaries to extend the impact beyond the life of the program. Lack of capacity to design bankable projects usually comes up as a setback. Participants shared their local experience in preparing, implementing, and maintaining adaptation projects. The 3rd Exchange Series on Climate Change Adaptation: Is ‘resilience’ an operational alternative to ‘adaptation’?